On 22 August 2015, the World Head of the Ahmadiyya Muslim Community, the Fifth Khalifa (Caliph), His Holiness, Hazrat Mirza Masroor Ahmad announced that over 567,000 have joined the Ahmadiyya Muslim Community during the past year. 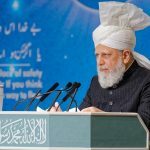 His Holiness made the announcement during his afternoon address at the 49th Jalsa Salana (Annual Convention) of the Ahmadiyya Muslim Community in the UK, which is taking place at Hadeeqatul Mahdi in Hampshire. His Holiness also announced that the Ahmadiyya Muslim Community had built over 400 new Mosques across the world during the past year. His Holiness further announced that the Ahmadiyya Muslim Community was now established in 207 countries of the world. His Holiness announced that the Ahmadiyya Muslim Community has now translated the Holy Quran into 74 languages. Hazrat Mirza Masroor Ahmad also gave a report of the activities and continued progress of the Ahmadiyya Muslim Community in all parts of the world. Earlier in the day, Hazrat Mirza Masroor Ahmad addressed members of Lajna Imaillah(Ladies Auxiliary organisation) where he said that Islam had granted true freedoms and independence to women. Later today, Ahmadi Muslims will take a pledge of allegiance to Hazrat Mirza Masroor Ahmad, the Fifth Khalifa of the Ahmadiyya Muslim Community. The Jalsa Salana will conclude Sunday afternoon with an address delivered by Hazrat Mirza Masroor Ahmad followed by a silent prayer in thanks to God Almighty. It is expected that more than 30,000 people have attended the Jalsa.